Part 2: a continuation of my light hearted look at Knitters. This species of Knitters typically works with the finest weights of yarn. They produce a large variety of projects but by far the most popular appear to be shawls.They prefer their knitting to be of the holey variety. Some show a proclivity towards highly romanticized and overly feminine pursuits as the reading of Jane Austin and Bronte sister novels. Some lace knitters specialize, focusing on Shetland, Orenburg, Estonian or more obscure lace traditions. They are now everywhere...and often sneak lace into knitting projects in whatever way they can, socks, scarves, hats and cardigans. They appear to have originated in both mainland Europe and the Shetland Islands but origination is unclear due to the fragile nature of their product. The definition of lace knitting varies. 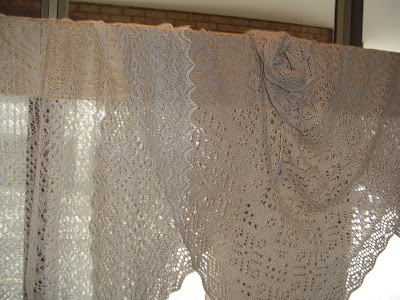 Some Knitters make a distinction between "lace knitting" and "knit lace," saying that lace knitting is created when you have pattern rows only on the right side of the work, while knitted lace has pattern rows on every row with no resting row.Their calls often include discussions regarding the points of their needle tips. Preferences seem to be for long and pointy but materials differ widely from slick metals to stickier woods and bamboo. Forms of cast on and cast off are debated with many schools of thought. A few slip into a completely different tradition using crochet hooks to cast off. This group has a highly developed aesthetic, honed over many years of practice. Often they have experimented with many different types of materials before settling on construction techniques of knitting. They tend to forms of work that include large scale installations in public spaces. Many also utilize machine knitting due to the volume of knitting required. Most often found in Art schools and galleries. Frequently working on or holding the designation Bachelor of Fine Arts. Most are of a highly intellectualized variety and include a large amount of social commentary. Discussions include choice of mediums, meaning to the greater human condition as well as self expression and challenges to cultural preconceptions. Acceptance into the larger art world was relatively late in the last century and socialization with the traditional knitting world is relatively rare.